Which GOP Candidate’s Tax Plan Is the Most Pro-Growth? 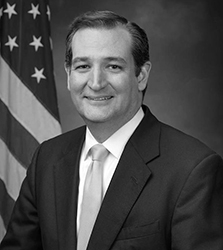 Ted Cruz is a first-term U.S. senator from Texas who has established himself as an uncompromising and unflinching advocate for limited government and conservative values, and a staunch critic of Republican leaders in Washington, D.C. who he believes have joined with or at least are unwilling to fight big-government liberals. Cruz was the first candidate to officially announce his campaign, at an event at Liberty University on March 23, 2015. Cruz has been called “off-the-charts brilliant” by Alan Dershowitz, a prominent liberal who was one of his professors at Harvard Law, and his legal career has shown a high degree of skill. He is a renowned debater and speaker, and his firebrand style has captured the support of many conservatives. He has a grasp for policy detail that is likely to serve him well in interviews and debates. Cruz holds conservative views on nearly every issue, favoring fundamental tax reform and lowering the overall tax burden, repealing Obamacare and replacing it with a market-oriented health care system, opposing climate-change regulations or curbs on energy production, and taking a stand against crony capitalism by opposing corporate welfare in its many forms. He strikes a middle ground between the generally interventionist, hawkish wing of the GOP and the less-interventionist libertarian wing of the party on foreign policy and domestic security, and he is a strident advocate for socially conservative positions. Cruz has many assets as a candidate, including his excellent communications skills, although one of the biggest concerns he will need to address is that he is seen by many as not being electable in November, or at least not as electable as some of his rivals for the nomination. He has struggled to get the Republican establishment behind him, something that could hinder his path to the nomination. His very conservative views helped Cruz to win the Iowa caucuses, where he was also bolstered by an excellent campaign organization. He finished in third place in the New Hampshire primaries, doing much better than many thought he would in a state that has not traditionally been hospitable to socially conservative candidates, but third-place finishes in South Carolina and Nevada were considered disappointments. He rebounded somewhat on Super Tuesday, winning his home state of Texas as well as Oklahoma and Alaska, and finishing in second place in a number of other states. Since Super Tuesday he has won a handful of additional states and been the runner-up in most of the others, and is in second place in the delegate count. Cruz remains a serious contender for the Republican nomination in 2016, having done extremely well with his fundraising, and even after beginning the race as an underdog has risen to become one of the three leading contenders for the nomination. His basic strategy of courting very conservative voters and building a substantial organization to support his candidacy has put him in this position, but it remains to be seen if it will be enough to carry him to the Republican nomination. After his tenure as Texas’ solicitor general, Cruz joined the Houston-based Morgan Lewis law firm as a partner. He practiced at the firm’s Washington, D.C., office until he took his seat in the Senate in 2013. Cruz is married to Heidi Nelson Cruz, a managing director at Goldman Sachs in Texas. Heidi Cruz has also served at the National Security Council at the White House and was an adviser to President George W. Bush and then-National Security Advisor Condoleezza Rice. She serves on the board of Living Water International, a faith-based nonprofit organization that helps communities in the developing world create sustainable water, sanitation and hygiene programs.13 The couple has two children. Although he has generally been consistent in voting with his professed views, he has reversed himself on a few issues that seem politically opportunistic. While there is little to suggest Cruz has failed to keep his word to voters, some of his Republican colleagues in the Senate believe he has not been fully faithful to pledges made to party leadership. Cruz promised his colleagues in the spring of 2013 he would not actively work to defeat Republican incumbents that weren’t sufficiently conservative, but in February 2014 it was discovered he signed a fundraising letter for a Tea Party group trying to beat several incumbent Republican senators, including Thad Cochran, Mitch McConnell and Pat Roberts. Whether Cruz broke his word likely depends on whether signing a fundraising letter constitutes “actively” trying to defeat incumbent Republicans. There is little to suggest unethical or scandalous behavior on the part of Cruz, although he failed to report during his 2012 campaign that he received a substantial loan from Goldman Sachs and a line of credit from Citibank that helped fund his candidacy, disclosure of which was required by federal election law.23 He did report the loans in ethics filings after he was elected. Cruz has received a number of distinctions throughout his career. As a litigator, he has a lifetime record of 23 wins and 4 losses in the courtroom. He has also won the “Best Brief Award” from the National Association of Attorneys General (NAAG) for Supreme Court briefs he authored in 2003, 2004, 2005 and 2006.25 American Lawyer magazine named him one of the 50 Best Litigators under 45 in America in 2007. Cruz also is a fabulous communicator and articulator of conservative principles. Professor Alan Dershowitz, not noted for his historic sympathy for conservatism, said of his days at Harvard Law School, “Cruz was off-the-charts brilliant.” He won several different awards as the best student speaker in America, and Cruz was semi-finalist in the 1995 World Universities Debating Championship. He is a very effective and unflappable communicator of conservative values, and while no one was Reagan but Reagan, Ted Cruz is the best articulator of conservative values at the national level since Reagan. In mid-November 2015, Cruz proposed suspending the H-1B visa program that brings skilled foreign workers into the country legally. He pledged to stop any increase in legal immigration until domestic labor participation returns to what he called “historical averages.” This represented a reversal of his past support for increasing the number of H-1B visas and green cards. Some may continue to harp on his previous dual citizenship status, despite his renouncing his Canadian citizenship – something he didn’t even realize he possessed until recently. While it appears that he is cleared of the hurdle from a legal standpoint, it doesn’t mean that it can’t or won’t be a distraction on the campaign trail. His wife’s profession, her reported earnings, and her employer (Goldman Sachs) could also be a vulnerability, particularly in a general election where populism is likely to be a headline theme, especially after it was used so effectively against Romney in 2012. Cruz comes from a far humbler background than Romney, however, and is a skillful speaker unwilling to back away from fights, so he is far better equipped than Romney to effectively challenge attacks on his wife’s career. Cruz is seen by many of his colleagues as self-serving and egotistical, and he has been referred to as the most despised man in the Senate. Those in Republican leadership considered his filibuster strategy that caused the federal government shutdown a “tactical error” and “not a smart play”156 while Cruz considered it a victory. Simply put, Cruz’s unwavering and uncompromising persona is likely to be as much of a liability in a general election as it will be an asset in the nomination fight. Cruz will also battle the perception that he is relatively inexperienced at this point in his career, having only served in the Senate since 2013. While he had a highly accomplished and stellar career prior to becoming a senator, there is little in his background to suggest he has much executive experience, something voters may hunger for after the generally poor management skills demonstrated by Obama, who also had only two years in the Senate before running for the highest office in the land. Born in 1970, Cruz may find his relative youth is seen as a drawback by some voters.